Lovely townhouse with panoramic country views located near the Old Course golf course and Brown`s healthclub and gym. This large townhouse offers a large enclosed garage and private drive alongside offering a 4th bedroom with en suite bathroom. It is further composed of 3 bedrooms / 4 bathrooms, living / dining room with wood-burning fireplace and a modern fully fitted kitchen. 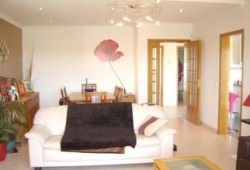 The property is to be sold fully furnished and has been decorated and furnished to a high standard. The house is situated on a small complex with a large central swimming pool and beautifully expansive landscaped gardens to enjoy. The townhouse is only a 6 minute drive to the marina and beach, Browns healthclub, the Hilton Cascatas holiday resort is only a 10 minute walk away.